Earlier this month, we reported that Marvel is developing an untitled Spinoff Series for Marvel's Agents of S.H.I.E.L.D., which could debut as early as this fall. 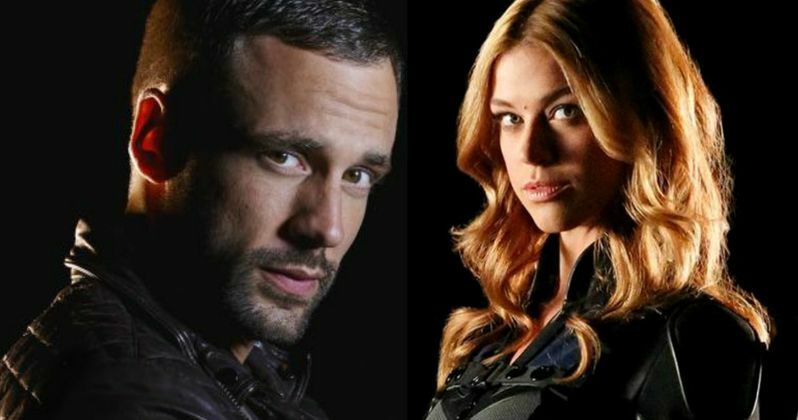 No plot details were given at the time, but today we have a report from Deadline, which reveals that Adrianne Palicki and Nick Blood, who joined the cast of Marvel's Agents of S.H.I.E.L.D. this season, are currently finalizing deals to star in the spinoff. While we still don't have any official plot details, the spinoff will be set up from events in Marvel's Agents of S.H.I.E.L.D., so it's possible that the new series could revolve around the secret plan their characters Bobbi Morse, aka Mockingbird, and Lance Hunter have been carrying out in the back half of Season 2. Both Adrianne Palicki and Nick Blood have quickly become fan favorites on the show since joining the cast this season, and since we still have five episodes left in Season 2, we'll surely know more about where this spinoff is heading after the season finale. Bobbi has worked undercover in the Hydra labs throughout the season, and Lance is a deadly sharpshooter. They were also once husband and wife before they joined Coulson's team, a dynamic which certainly may be explored more fully in the spinoff. Marvel's Agents of S.H.I.E.L.D. executive producer Jeffrey Bell and co-executive producer Paul Zbyszewski are writing the pilot script, with Paul Zbyszewski expected to serve as showrunner if the show is ordered to series. ABC will not issue a formal green light for the project until the script comes in, with the network hopes will happen before their upfront presentation next month. It's possible that this spinoff could air during Marvel's Agents of S.H.I.E.L.D. 's hiatus, which is what happened this year with Marvel's Agent Carter airing between the first and second halves of this current season. Marvel's Agent Carter has not been officially renewed yet, but it remains in contention for a second season order. ABC is also developing another mysterious Marvel show with American Crime creator John Ridley, which is rumored to center on Miss Marvel, Kamala Khan, but that has not been confirmed. Where Was Clark Gregg in Marvel's 10th Anniversary Photo? How Does Agents of S.H.I.E.L.D. Tie Into Civil War? Captain America: Civil War Has a Ripple Effect on Agents of S.H.I.E.L.D.